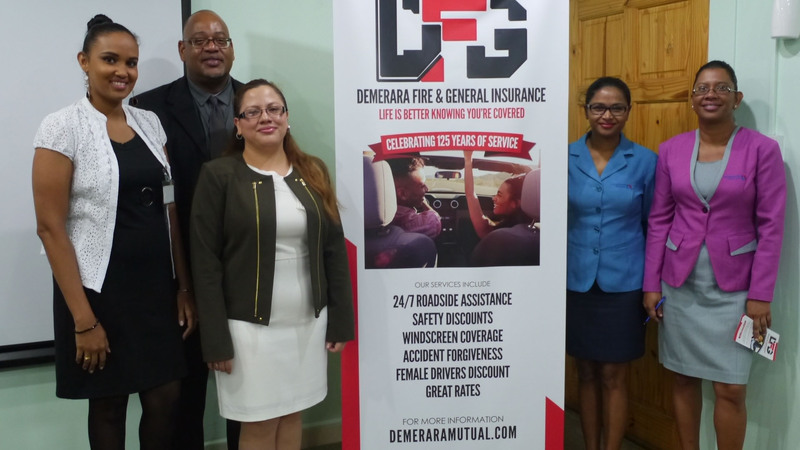 The Demerara Fire and General Insurance Company yesterday launched an upgraded motor insurance service as a means of attracting more customers, given the competitiveness of the market. Melissa De Santos, executive in the company’s legal office, said the new package includes a roadside service, a replacement car and discount for female drivers. She believes that the company is the only one that is offering a rental car service. “If you are in an accident, we will provide you with a replacement rental car for a maximum of fourteen days,” she explained. The female drivers can benefit from a maximum discount of 10%—an offer that is already provided by their competitors. She said the discounts may go all the way up to 30%, while life policy holders can benefit from a further 5%. The company also offers windscreen protection coverage for repair and replacement. De Santos advised that it is better to repair a windscreen, rather than replace it. This ensures that the original seal is not compromised and new technology that is available repairs and hides the cracks completely. Perry told the media that customers can now enjoy a “24/7 roadside service,” but indicated that it has to be within certain boundaries. He noted too that the company offers special packages for customers if required, at an extra premium rate. Some additional benefits include a maximum of 12 roadside services per year, which will be built into the premium package. There is a further offer of “accident forgiveness” for customers who are involved in an accident for the first time, which guarantees that their premiums do not increase. He clarified, however, that the accident has to be within a “certain cost range” and within reasonable circumstances.